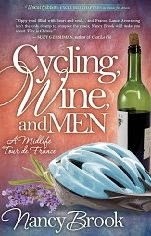 My review today is for Cycling, Wine, and Men: A Midlife Tour de France by Nancy Brook. The title of this book includes three things I love and it’s set in France so I just HAD to read it. By her early forties Nancy had already accomplished a lot, including picking herself up after her husband disappeared with money from their joint business, leaving her a single parent with debts and in trouble with the police. However in terms of a serious relationship and time for herself, things were lacking in her life. Putting her corporate life on hold for a much needed holiday we join Nancy as she makes the amazing journey across France from Bordeaux in the west to the Alps in the east, by bike. Nancy and I are of a similar age and although I live in France and love cycling here the thought of undertaking a trek by bike from Bordeaux to the Alps is still quite daunting. Nancy sets out to accomplish it and on her first visit to France. She flew into Paris from the States with her luggage and bike (all packaged up), immediately found her way onto a train to Bordeaux and within a few days was cycling the vineyards with a group she only just met in a country she had only just arrived in – chapeau Nancy. I loved the day-by-day descriptions of the cycling route, she was honest, enthusiastic and her determination was quite something. France was somewhere Nancy had always wanted to visit and it was refreshing to experience her fresh-faced love for this beautiful country and to share in her enthusiasm for some of the very French scenes she saw on the way. It is true that we often tend to take for granted what is on our doorstep. There is no doubting Nancy is a strong, independent woman, but she admits to being a romantic too and her need for the fairytale happily ever after is something she discusses in the book. For me, there was a bit too much musing on the various men and what went wrong, but as the title mentions men maybe I shouldn’t have been surprised by this. What this book did give me was a kick up the backside - if you can do it Nancy, why the hell can’t I? However, I’m not sure camping is my idea of a good holiday and especially having cycled between 80 and 100kms each day. I do like my comforts. If you are a cyclist or an armchair traveler you will love this journey across France that takes in vineyards, hilltop towns, markets, fetes, mountains and gorges all without the discomfort of riding a bike and sleeping in a tent. Cycling, Wine, and Men: A Midlife Tour de France is available in paperback and ebook format and links to Amazon are below.